In 1944 and for a few years afterward, there was a circular drive, encompassing a rose garden, leading from the Laird Street entrance to the front step of the Granite House. Beside the front gate was a huge pine tree and nearby an open-sided rotunda. On either side of the front steps were two huge clam shells. The common belief was that the original owner, Judge Harding, had accompanied State Governor, Sir William Glasgow, on an exploratory venture to New Guinea and that these shells were a memento of that expedition. The names were said to have been inspired by a visit to Granite House by a junior Royal Prince. Perhaps Edward VI? The St. John’s Wood Estate may have been named prior to that Royal visit, but fairly obviously it was inspired by the St. John’s Wood in London. The origin of Royal Parade is obvious; Piddington Street was named for an Admiral Piddington, Aide de Camp to the Prince; Laird Street would commemorate his being a Laird of Scotland; Gresham Street, probably for some other luminary in the party; Grand Parade for its majestic views. London Street, a late edition, who knows? It seems to have been done in sections. Piddington Street and points west seem to have been developed first. Certainly there were homes there when I first came to St. John’s Wood. The area of Laird Street, opposite the gate to Granite House, plus the eastern side of Buckingham Street, heading south perhaps came next. An early resident – Fred Entwhistle, who lived in Laird Street opposite the gate to Granite House, once told me that that area was seen to be very desirable, attracting a price of 20 pounds per 24 perch block, whereas the blocks on the eastern side of Buckingham Street (heading south) went for 10 pounds. The northern reach of Buckingham Street was largely developed by ex-servicemen after WW2, although there were one or two houses in the street prior to that. Our own 24 perch block of land cost 80 pounds in 1945. Quite a stretch from the current land prices in The Woods. At one stage there was a small sign “Glenview” nailed to a tree on the north eastern side of St. John’s Avenue. I have no idea what it represented. Maybe it was an early section of the estate? Perhaps an ambitious name for the dirt track, which at that time was St. John’s Avenue? Or perhaps a statement by a nostalgic Scotsman in admiration of the view over the creek to what later became the sports fields. In any case, the sign disappeared soon after the development of the area. For many years, the brick house at the corner of Laird and Piddington Streets was occupied by David and Maureen Wolfgang. David was a retired magistrate. He was fondly dubbed, “The Archbishop of Piddington Street”, because ever a friendly man, he ended every neighbourhood encounter with a “God Bless”. He was a lovely man. 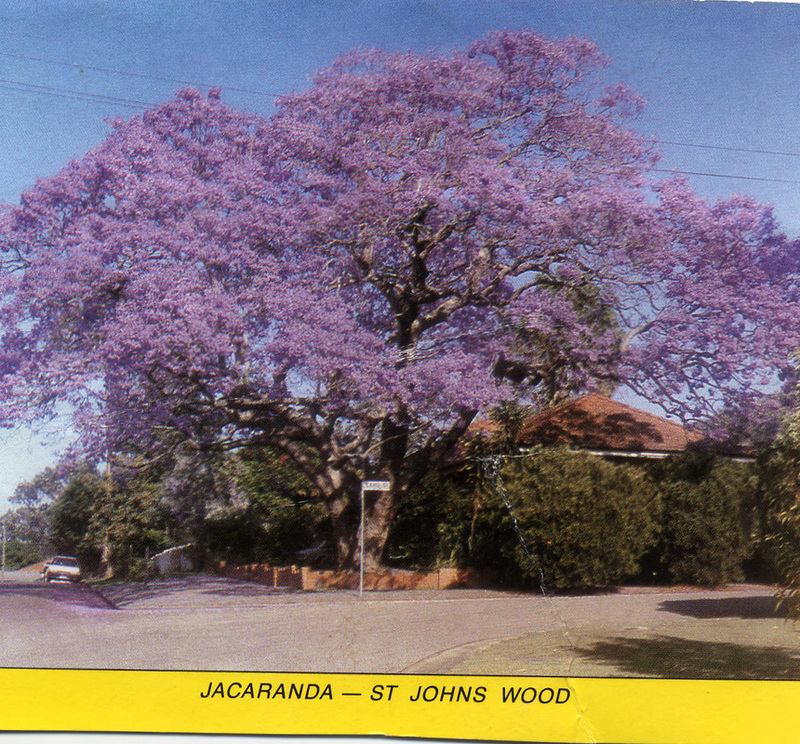 A feature of the front corner of their allotment was a magnificent Jacaranda tree, which once was featured on the Christmas card, which was sent out by the Brisbane Port Office. Maureen once told me that for quite a few years afterwards, a Christmas card arrived at their letterbox addressed to “The Jacaranda Tree”. When a later owner of the property cut down the Jacaranda tree, Woods residents were outraged. The hall, erected on land to the side of Granite House, was a much valued community Centre for years. It was said to have originally been some sort of public structure at West End, and later became one of the early school rooms at Ashgrove State Primary School, and later still, moved to the grounds of Granite House. In my time it has served as a meeting place for the Boy Scouts and Girl Guides-before they established their own premises; as a Baptist Sunday School; and as a polling booth on election days. These days it has been rebuilt into a stylish home, reached via an easement leading off Laird Street. Even though St. John’s Wood is virtually encircled by Enoggera Creek, and except for the bridge being occasionally briefly cut, the question of major flooding was never seen as a serious threat. The conventional wisdom was that Brisbane City would need to be under water before we were flooded. Well, we almost confounded that confidence! In the 1974 floods the Williams’ house, at No.12 Royal Parade was floated off its stumps, crashed into the side of No. 10 Royal Parade and was never restored. Houses at the eastern end of St. John’s Avenue had water up to their floorboards. The Gresham Street bridge leading onto Waterworks Road was under meters of water. Waterworks Road was flooded some 70-80 metres in both directions from the bridge. Many of us couldn’t get home for some time. Thankfully the water receded before too long, and we were able to get home to watch on the TV as other areas of Brisbane were inundated over the next few days. This huge cavernous old hall was situated on the site now occupied by the The Woods Early Education and Pre-school, on the corner of Gresham Street and Royal Parade. Movies were played there each Saturday night. Patrons were seated in old fashioned canvas deck chairs. The only drawback was the occasional thunderous rattle as vehicles drove across the bridge, the deck at that time consisted of loosely anchored planks. By the time we got the flash new comparatively noiseless modern bridge we know today, the Saturday night movies were long gone. Not surprisingly, there was a huge surge in the birth rate after WW2 and The Woods was no exception. 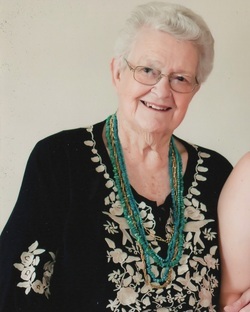 In 1947, when my daughter was born, there were approximately seven babies born within a few months of each other - all girls. Five years later, when my son was born, there was a similar surge of births – all boys. Must have been something in the water! The huge clump of bamboo at the north eastern corner of the Woods, near the footbridge leading to the Ashgrove Bowls Club and Sports Ground, provided a periodic tourist attraction, when it regularly went up in flames. It was an awesome sight. The heated bamboo stalks went off with sound effects similar to rapid gunfire, while flying sparks produced a Guy Fawkes type spectacle, to the concern of those living nearby. We never knew what caused the blaze, but everyone was relieved when it no longer occurred. Periodic minor flooding of Enoggera Creek. This provided a great adventure for the male youth of the area. Long after the lads were too big for corporal punishment, it was revealed that whenever the creek was in reasonable flood, the boys would cycle out to the culvert at Bennetts Road, near the golf club, and take turns at diving into the flood. They would then ride the water all the way down to Wardell Street, where a mate would be waiting with a bicycle to take them back to Bennetts Road for another turn. At this distance in time one can only say there are some things for which parents should be grateful for having been blissfully unaware. At the time of the Granite House centenary, it was said there had been an early aboriginal presence in the area. At that time Land Rights was a sensitive public issue and as far as I know the idea was not explored. In these enlightened times, the subject might be worth further research. At a time in history when denominational prejudice was prevalent, St. John’s Wood was practicing ecumenism long before it became the official policy across the faiths. An elderly Catholic lady, who had lived in many different parishes across Brisbane, told me that the absence of religious prejudice in The Woods was quite extraordinary. We were a united community, which cared for its neighbours. Differences of faith, were never an issue.